Inhalation Anesthesia Market size was valued over USD 1,285.8 million in 2016 and is expected to witness more than 3.5% CAGR from 2017 to 2024. Inhalation anesthesia market should witness robust growth over the forecast timeframe. Rising prevalence of chronic diseases that includes cancer, respiratory and cardiovascular disorders coupled with increasing number of surgeries performed in ambulatory surgical centres are the foremost factors that should stimulate inhalation anesthesia market growth. Elderly population is susceptibility to acquire diseases such as, neurological disorders, respiratory diseases, and cancer. Moreover, older individuals have other health issues that include spinal, gastro and orthopedic problems these in some cases give rise to requirement of surgeries thereby, boosting industry growth during the forecast period. Increased healthcare expenditure and economic progress in developing nations along with increasing number of emergency surgical procedures will upsurge inhalation anesthesia market growth. In addition, demand for ambulatory surgical centres is rising due to factors such as, convenience, cost-effectiveness and low infection rate coupled with value based payment model should drive business size. However, the concerned adverse effects of anesthesia should hamper industry growth. 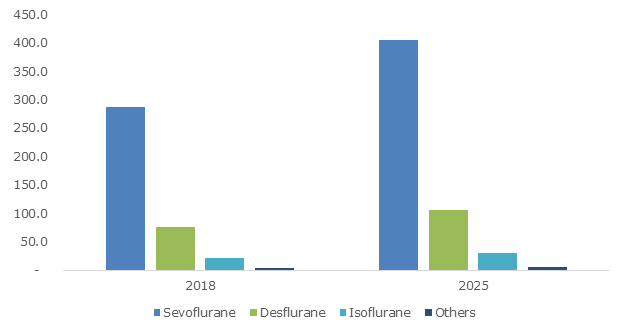 Sevoflurane dominated inhalation anesthesia market in 2016. The growth is attributed to high preference for sevoflurane and suitable for children and adults for maintenance as well as induction. Moreover, associated characteristics such as, low flammability, dearth of annoyance to airway passages, intrinsic stability. In addition, other benefits include, low blood gas solubility permitting quick initiation of arrival from anesthesia, non-pungent odor, nominal respiratory and cardiovascular side effects, less effect on cerebral blood flow should boost segment growth. Desflurane will contribute for substantial revenue share in 2016. The advantages associated with the product include, curtailing low risk of nephrotoxicity and hepatitis as well as it accounts for quick and early recovery as compared to sevoflurane. It is highly fluorinated and used in maintenance for general anesthesia. However, it can cause airway irritability and tachycardia when directed at more than 10 vol% absorption. Maintenance held largest revenue share in 2016 due to advantages such as, safety of airway. Depth of anesthesia throughout maintenance is controlled with no trouble caused by regulating aeration form, vaporizer outputs, and overall flow proportion. High stimulated oxygen is generally on condition through inhalant anesthetic all throughout maintenance. Moreover, fast recovery offered as compared to injectable groupings will drive industry growth. Induction should witness considerable growth over the forecast period due to properties such as preservation of impulsive ventilation and redistribution throughout apnea, it is also used for inhalation induction in respiratory airway problems. U.S. inhalation anesthesia market accounted for largest regional share in 2016. Increasing number of plastic surgeries along with rising prevalence of chronic lower respiratory disease will fuel adoption of inhalation anesthesia. UK will witness significant industry growth due to rising prevalence of cancer coupled with increasing rate of surgical procedures. Moreover, inhalation anesthesia used in these surgical procedures will drive regional business growth. 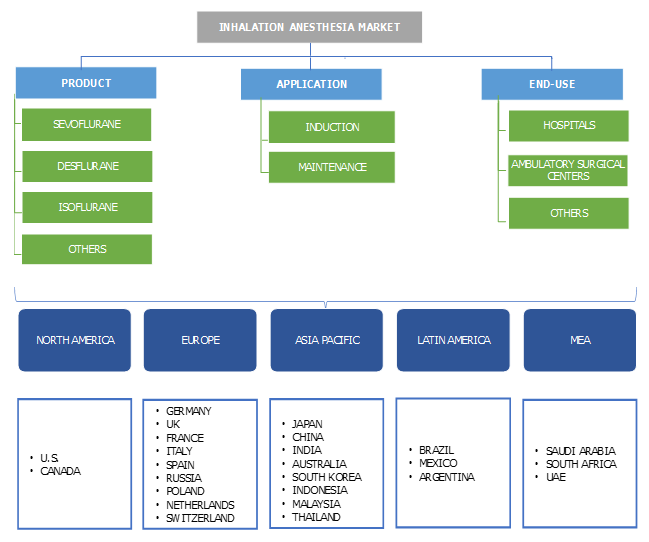 Mexico inhalation anesthesia market should observe considerable growth due to rising chronic diseases and increasing demand for outpatient surgeries. Increased adoption rate of inhalation anesthesia coupled with rising awareness levels will fuel industry expansion. Saudi Arabia held substantial regional revenue share due to rising incidence of respiratory syndrome coronavirus (MERS-CoV) and high adoption in bariatric anesthesia ladder, labor pain, and anesthesia for fetoscopic intrusion. Some of the prominent players in inhalation anesthesia market are Baxter International, Hikma Pharmaceuticals, Mylan, Eisai, Halocarbon Products, Abbott, Piramal and Lunan Pharmaceutical. In September 2015, to complement with its COPD product Perforomist, Mylan with Theravance Biopharma initiated a phase lll program for Revefenacin, an antagonist having application in COPD. The approval will mark a step forward in providing more robust portfolio in the healthcare market with further enhancement of the company in nebulized respiratory market. Enhanced access to healthcare treatments, and rise in disposable income should fuel inhalation anesthesia market globally. Moreover, growing elderly population, rising incidence of respiratory disorders such as, chronic obstructive pulmonary disorder (COPD), cancer. Increased prevalence of cataract surgeries across the world should propel inhalation anesthesia market size. Wide range of application in medical sector coupled with increasing demand for inhalation anesthesia should further drive industry growth over the forecast period. Furthermore, growing exposure to critical care due to increased number of road accidents along with upsurge in occurrence of injuries and increased risk of acquiring respiratory disorders will propel industry size. Growing demand for low cost anesthesia during treatment and surgeries should further boost industry expansion.